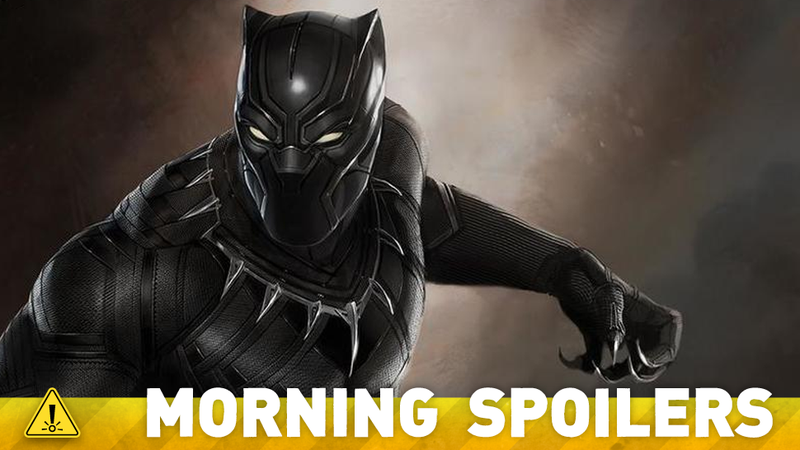 What's In Store For Black Panther, Outlander, Gotham And More! A few new hints about Domhnall Gleeson's The Force Awakens character emerge. Gotham casts a new villain, and for once, it's not a character from the comics. Plus, Agent Carter's showrunners talk Peggy's love life post-Steve Rogers, and our first look at Ian McKellen in action as Sherlock Holmes. Huzzah for Spoilers! Who said I was prepping? [Laughs] I think right now, it's just going through the possibilities of what he can do. It's a brainstorming phase, trying to figure out what it looks like — I'm going to be as vague as I can! — what it looks like and what it should feel like in certain moments. But just going through [the material], because there's always a difference from one story to the next of who he is — trying to find a way to merge those things together. Because I think that's always fun when these movies work: it's when people see several things satisfied at one time. And I think that's been the fun part so far. According to its source, Rey (Daisy Ridley) and Luke Skywalker (Mark Hamill) go into hiding for the same reason. Her parents are Han and Leia, and her mission is to protect a lightsaber capable of bringing evil to the galaxy. Kylo Ren, the one with the fancy "crossguard" lightsaber, is looking for artifacts to open up a tomb. The tomb is being protected by Luke, and inside he is tortured by evil spirits. Domhnall Gleeson is a former rebel and has a very significant mom or dad. He's now part of the Empire, and the reason for him defecting is because he learned that the Rebels were creating a secret super weapon. (Hmmm, more powerful than the Death Star?) His mission is to find Finn, being played by John Boyega, and to secretly destroy both the Empire's and the Rebels' "super weapons." Gleeson will be commanding the shock trooper, with Gwendoline Christie as the leader. She'll be an arrogant and ruthless chrome trooper with black and red cape who's helping Gleeson hunt Finn. She is described to having big scars and a military hairstyle. As for special abilities, she'll be able to cloak herself. "She still got to get over Captain America," Michele Fazekas told us. "That's kind of her whole journey. She still grieves him, so that's a big part of her journey for this season." But, of course, there's no denying Peggy's chemistry with Edwin Jarvis (James D'Arcy), who has been available for Peggy day and night... is Mrs. Jarvis going to think that her husband is cheating? "The one thing I love about the character of Jarvis is that he truly loves his wife, and as much as we see what wonderful chemistry she has with Peggy, it calls back to me more of the Mulder & Scully in the first several years of [ The X-Files] where you really love their chemistry," Tara Butters said.